The Secret is one of Best Selling Book on Law of Attraction , it has helped many of us understand that we create our own reality. But sometimes we are unable to understand why at times we are able to manifest situations, relationships, a new job, money etc etc quickly while sometimes it takes much more longer than we can anticipate and then we wonder does it really work?? 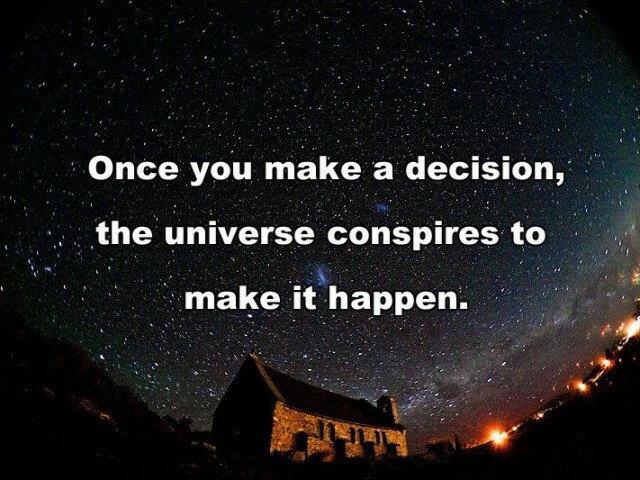 I recently was having a counselling session with a dear friend who has been truly inspired by Rhonda Byrne series of books on Law of Attraction and Manifestation but was having a hard time manifesting a committed relationship. This blog is about understanding that universal laws always work in tandem and not in isolation and how you can ease Manifestation in life by understanding these laws. Happy Reading !!!!! I have been lately very impressed with Swami Sivananda and his seminal work on Thought Power. It is interesting to understand why every individual has different thoughts and hence different desires in life . For some money manifestation is high on priorities for others it is a happy fulfilling relationship. So In this blog I have tried to touch upon other laws and principles that also play a vital role or influence manifestation. The pretext of this blog is that nothing can work in isolation in this universe 🙂 It is a super duper intelligent system. Every individual who incarnates on this Earth has a Life Purpose this purpose keeps evolving with the spiritual growth and our ability to live the Purpose. Our Purpose in Life is based on our past life samskaras (imprints). As said by Swami Sivananda “The mind is a storehouse of samskaras, predispositions, predilections, etc. A child is born with his individual samskaras, with his past experiences transmuted into mental and moral tendencies and powers. The mind evolves through the impressions received from the universe through the senses. It will take many lifetimes till it gathers the complete experience of the world. Every person is born with his inherent samskaras which are embedded, lodged or imprinted within chitta (Subconscious mind is termed ‘Chitta) which is the seat for prarabdha (“Prarabdha is that portion of the past karma which is responsible for the present body.) or past karma. In earthly life, one gains many more samskaras or experiences through actions, and these are added to the original store and become the future sanchita karmas (accumulated actions). This is the reason why since we are born we may have liking towards specific things whereas aversion to some. So someone will love sweets where as the other person may have an aversion to sweet (just a basic example) this is all based on our past life experiences. 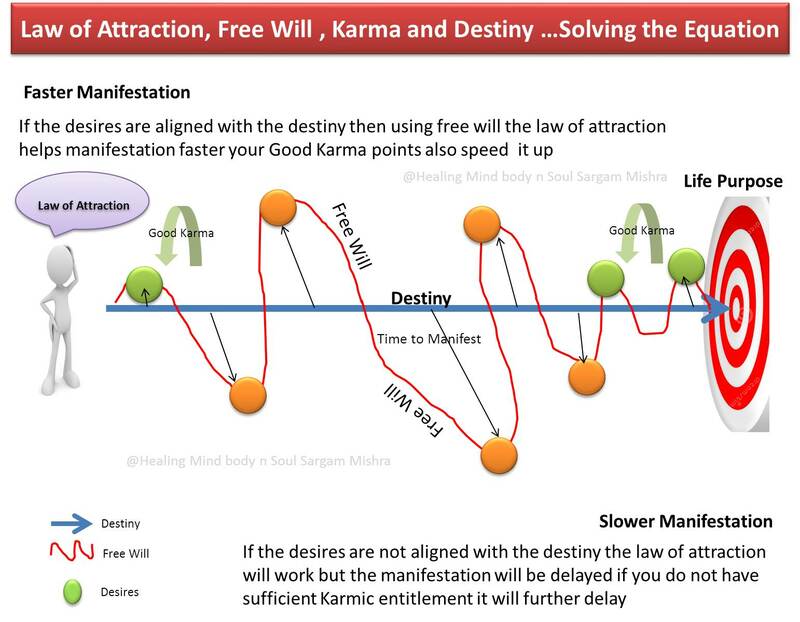 Now let us understand the concept of Fate/Destiny or what we call Karma and how does it work with the ‘Free Will’ granted to human beings mostly we all feel stuck up with the the doctrine of Karma and I keep hearing I suffer because it is destined due to my previous life Karmas. Blaming Destiny or Fatalism is the doctrine that all events are subject to fate and happen by unavoidable necessity. 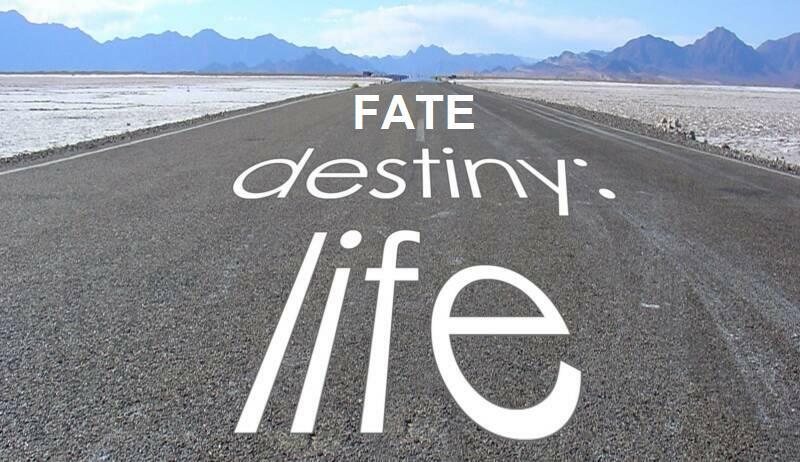 Fate is otherwise known as luck or fortune/destiny. That indefinable mysterious something which brings trials, successes and failures to man, which shapes and moulds him by teaching lessons of various sort, which takes care of him like a mother, which brings various sort of experiences, which brings cloudy days and days of bright sunshine, which raises a beggar to the level of a landlord and hurls down a mighty potentate to the level of a street-beggar, which gives different kinds of fruits and experiences to two people of equal talents and capacities, which made Napoleon at one time a terror in the eyes of the people and at another time a prisoner, and which makes a certain portion of the life of a man quite stormy and another portion quite smooth, is called fate. Fate educates and instructs man. However whimsical the fate may appear to operate, it works in harmony with the law of causation. Destiny is one’s own creation. Man acts and thinks and develops his own character. He creates a web like the spider or a silk-worm and entangles himself in its meshes on account of the three knots, viz., Ignorance, Lust and Karma/Actions. He himself has enthroned fate to the level of a king and obeys its order owing to his ignorance and its effects. Every act produces in the performer a double effect, one in the inner nature in the form of a tendency, good or bad, and the other in the form of fruit, reward or punishment. The past Karma influences the present life in two ways, first in the form of character or tendency internally and as fate externally. 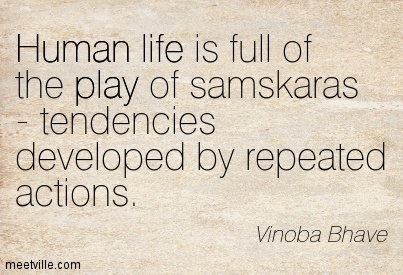 If you do an action, it creates a Samskara or subtle impression in the subconscious mind or Chitta. The Samskara causes a tendency. Tendency develops into a habit by repetition of the actions. The habit manifests as character. Character develops into destiny. This is the order: Samskara, tendency, habit, character, and destiny. The faculty of choosing is termed will. This will is free by its own nature. Man has a free will by his birthright. It asserts itself at every moment of our lives. Bear in mind that every small act that you perform is the resultant of triple conjoint forces, viz., freewill, character and destiny. The sphere of activity varies according to the nature of your Karma and the character formed by it. If you have done virtuous actions in your previous birth and if you have developed an exemplary character, “your will have a wider field of activity and vice versa. Determinism is the doctrine that all things, including the will, are determined (limited) by causes. This is the converse of free will. It is otherwise known as necessitarianism. Man has power to choose between the alternatives which fate brings before him. In choosing between them he may either follow his tendencies produced by his past actions or struggle against them. The will of a man is ever free. The arguments which are advanced by determinists in saying that human will is determined are not sound and tenable; they fall to the ground. Oh Boy the above quote makes you feel so so so powerful 🙂 and that is what has created so much buzzzzz about LOA it has given us the power boost. Now let us see where does the Law of Attraction come into picture so to begin with lets understand What is Law of Attraction?? Everything in our universe is energy – everything you see, feel, hear or otherwise perceive. Everything within and beyond our perceptions is energy as well. Everything. Energy always moves. The fact that you can see, hear or smell – means that energy moves and you are capable of tuning into it’s vibrational frequency. Energy cannot stop and cannot disappear. It can only change it’s form. Energy always flows. Our thoughts are energy. What we now see, feel and touch has only existed in the form of thought just a little while ago. As soon as you conceive and entertain a thought – any thought – it immediately flows into the endless universe and attracts like thoughts. They in turn attract material manifestations of the similar energies. Miserable thought manifest more misery, abundant thoughts adds more abundance to the creator of it and to the world around. That which is like unto itself is drawn – is the major premise of the Law of Attraction. Like attracts like – and the only way to manifest new and improved version of the outer world is to change the vision within your inner world – your inner vibrations – your inner thoughts and, as a consequence – your inner emotional state. So how would we go about manifesting the things we want? More abundance? More money? More creative energy our your lives? Your dream job or dream body condition or your dream soulmate or partner? I found that simple car analogy works the best to explain not only the process itself but also the proper order of actions. Imagine you want to take your car and drive to your vacation destination. Some exciting place where you never been before. Decide where you want to go and prepare the road map: Set Intention and Make Decision to start moving toward it. Check your car – make sure it’s in good driving condition and there are no obstacles to movement: Get your mind ready for the trip. Release the breaks: Let go of Resistance. Keep driving according to your roadmap, never mind occasional stops or detours. Keep your destination in mind, keep driving and have fun along the way in expectation of arriving to the wonderful place where you never been before: Enter and Maintain the Desired State. So if at times you find LOA not working for you then just start sowing seeds of Karma, start giving what you want this will add additional energy to help you manifest faster.The universal laws of Karma, Free Will ,Destiny and Law of Attraction do not work in isolation but there is an intelligent system in place. So some time respect this intelligent system and let go of resistance the universe will give you what is best for you………..This is also called the Law of Least effort. Very good article. So many interesting concepts. One quote related to The law of least effort that I can remember now – “Let go and let God”. Blessings and best wishes to manifest your desires. Very well written Sargam…nicely articulates some of the key messages from “the secret”.. Coincidentally just this morning I decided to re read “the secret” starting today evenig..and your article is a perfect segway for me to get started..